β-Thalassaemia is an inherited disease characterised by an imbalance between production of α and β globin chains of haemoglobin resulting from impaired production of β chains. The genes responsible for β-thalassaemia carry mutations in areas coding for the β globin gene or regions regulating the expression of this gene. Patients who are homozygous of compound heterozygous for the gene are symptomatic. They manifest as thalassaemia major. Thalassaemia major is a fatal illness where patients suffer the consequences of anaemia, bone marrow hyperplasia and iron overload. Iron overload that results from increased iron absorption and repeated transfusion is the cause of death. The treatment consists of lifelong transfusion with iron chelation or in those who have a matched donor, allogeneic bone marrow transplantation. The risk of inheritance of β-thalassaemia in offsprings when both parents are heterozygous is shown on the left. There is a 25% risk of thalassaemia major, 50% risk of heterozygous β-thalassaemia and 25% of the offsprings will be normal. If one of the parents does not carry the thalassaemia gene there is a 50% risk of the offspring carrying heterozygous β-thalassaemia and 50% of the offsprings will be normal. Risk of β-thalassaemia in children: β-Thalassaemia major is inherited in an autosomal recessive manner. If both the parents are heterozygous for β-thalassaemia there is a 25% risk of the child suffering from thalassaemia major (see figure above, left). 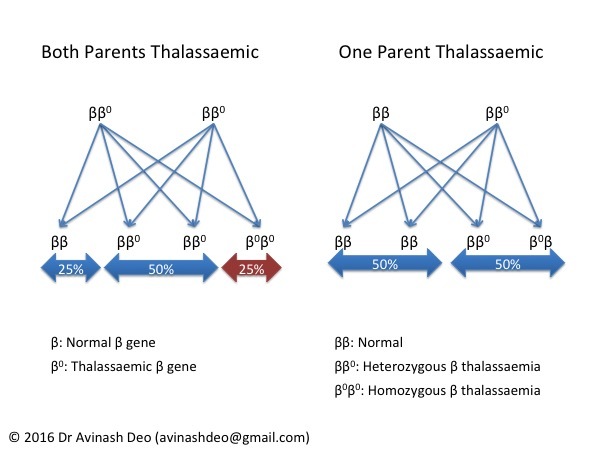 The most effective way to prevent β-thalassaemia major is to ensure that at least one parents does not carry the β-thalassaemia gene (see figure above, right). Diagnosis of an index case of heterozygous β-thalassaemia should initiate a search for all individuals carrying the β-thalassaemia gene in the family. Patients with heterozygous β-thalassaemia should be discouraged from choosing another heterozygous β-thalassaemia as a life partner. Those who make this choice despite counselling or those who already married should be explained the importance of prenatal diagnosis of β-thalassaemia major on conception and encouraged to undergo the same. Prevention of unnecessary iron therapy: Iron deficiency anaemia, like thalassaemia, is microcytic and hypochromic. Iron therapy alleviates the anaemia of thalassaemia only if iron deficiency co-exists. Iron therapy is associated with gastrointestinal adverse effects. Some patients with heterozygous β-thalassaemia have increased iron absorption and there have been reports of iron overload in β-thalassaemia trait (Br J Haematol). Diagnosis of heterozygous β-thalassaemia spares the patient unnecessary and sometimes dangerous iron therapy. Heterozygous β-thalassaemia minor is characterised by an imbalance between the α and β globin chains because of decreased production of β-chains. The clinical manifestations of thalassaemia depend on the degree on imbalance between α chains and non-α (β+γ) chains. Thalassaemia minor, the phenotype of heterozygous β-thalassaemia results when the ratio of α to non-α chains is 2:1 (Cold Spring Harb Perspect Med 2012;2:a011726). In pregnancy:The third trimester of pregnancy sees a plasma volume expansion accompanied by an increased production of red cells. In normal women the volume expansion is more than the increase in the number of red cells. Women become anaemic in the third trimester as a result of this discrepancy. Patients with β-thalassaemia trait show a plasma volume expansion but are not able to increase the number of red cells like normal women do. As a consequence women with heterozygous β-thalassaemia become more anaemic than normal women. This anaemia is usually mild and haemoglobin values lower than 8-9g/dL should prompt a search for another cause of anaemia. Iron deficiency anaemia is the commonest anaemia in pregnancy and it mimics thalassaemia. Serum iron and iron binding capacity may not be reliable in pregnancy and a serum ferritin must be performed for diagnosing iron deficiency. In case of autosomal dominant β-thalassaemia: Some forms of deletion β-thalassaemia result in the formation of an unstable β chain that forms inclusions. These inclusions cause ineffective erythropoietin and a thalassaemia like syndrome. Such patients are said to have a dominant β-thalassaemia and have the clinical picture of thalassaemia intermedia even when heterozygous. If the co-inherit an overdose of α thalassaemia genes: Manifestations of β-thalassaemia depend on the ratio of α to non-α chains. Thalassaemia minor results when the ration is 1.5-2.5:1 and intermedia when the ratio is about 4:1. Thalassaemia major is seen with higher rations. Some patients have three or even four α globin genes (ααα or αααα). These patients produce more α globin chains. Increase in α chains can push up the ratio of α to non-α chains and result in manifestations of thalassaemia intermedia in heterozygous β-thalassaemia. Similarly co-inheritance of α and β thalassaemias can attenuate the manifestations of thalassaemia. Haemogram: Heterozygous β-thalassaemia is characterised by anaemia, low MCH and low MCV. The MCHC is usually normal. The erythrocytes count is high and there may be a slight increase in the reticulocyte count. The peripheral smear shows microcytosis, hypochromia, poikilocytosis, basophilic strippling and target cells. Co-inheritance of α-thalassaemia attenuates the findings. The red cell indices are normal at birth. Changes associated with heterozygous β-thalassaemia become apparent by 3 months. By 6 months thalassaemic changes are firmly established. Haemoglobin A2: Haemoglobin A2 (HbA2) is in the range of 3.5-7%. Iron deficiency causes a disproportionate fall in HbA2 in patients with heterozygous β-thalassaemia but does not push the HbA2 levels in the normal range. Heterozygous β-thalassaemia with normal HbA2 is discussed below. Bone Marrow: The bone marrow shows erythroid hyperplasia with pyknotic normoblasts dominating. There is ineffective erythropoiesis mainly due to destruction of haemoglobinized precursors. Studies have shown approximately 25% decrease in efficiency of erythropoiesis. Iron Metabolism: Rate of iron absorption is slightly increased. Some cases of iron overload have been reported. Iron deficiency may co-exist the heterozygous β-thalassaemia particularly in pregnancy. Serum ferritin estimations should be performed to diagnose iron deficiency. Osmotic Fragility: Osmotic fragility is increased particularly after 24 hours of sterile incubation of erhthrocytes. It has been suggested that this be used as a screening test for heterozygous β-thalassaemia but has not gained widespread acceptability. Globin Chain Synthesis: Heterozygous β-thalassaemia is associated with a α:β ratio of 1.5-2.5:1. There is a continuous spectrum of changes with mild alleles having less pronounced effect on haematological parameters. Severe alleles have higher HbA2 values. Mild thalassaemia with high HbA2 suggest a promoter mutation. Heterozygous β-thalassaemia is a common disorder and a chance associations may be seen with other haemoglobinopathies or inherited disorders of erythrocytes. Fortunately no deleterious association has been found with most disorders these include glucose-6-phosphate dehydrogenase deficiency, hereditary spherocytosis and pyruvate kinase deficiency. α-Thalasaemia tends to reduce the α:β globin ratio. The amount of free α globin chain reduces attenuating the manifestations of heterozygous β-thalassaemia. β-Thalassaemia and sickle-cell diseases are common genetic diseases. Co-inheritance of the two is found in Africa, Mediterranean and sporadically through India. The symptoms depend on the relative amounts of HbS and HbA. HbA polymerises less than HbS. High levels of HbA reduce symptoms of sickling. HbF is excluded from and protects against sickling. The clinical manifestations of patients co-inhereting sickle-cell and β-thalassaemia depend on the type of thalassaemia allele inherited and the HbF levels. Sickle β-thalassaemia with β0 or severe β+ alleles: Mediterranean forms of β-thalassaemia trait are either β0 severe β+. Patients from this region have severe sickling symptoms and HbA levels <15%. Sickle β-thalassaemia with mild β+ alleles: African patients of sickle β-thalassaemia inherit mild β+ alleles. These patients have haemoglobin levels in the range of 20-30% and mild symptoms . Many do not have symptoms. Diagnosis in some may be made incidentally. Sickle β-thalassaemia with high HbF: Patients from Indian and Saudi Arabia have mild symptoms despite inheriting severe β alleles because of high levels of HbF. Heterozygous β-thalassaemia does not need any treatment. A family screening should be carried out to detect other members carrying the thalassaemic β globin gene. Iron therapy should not be administered to patients empirically. Some patient have an increase iron absorption and iron overload has been reported. Iron studies should guide iron therapy. Anaemia can worsen during pregnancy. Folate and iron supplementation may be needed.